The “Untouchables” have become the “Corruptibles.” There is leftist liberal Democrat corruption deep in the bowels of the FBI. But when you say this to liberals, who think one dimensionally, they only hear that the entire FBI is corrupt, not that there is corruption within the FBI. Evil people always hide among the good, just as Hydra hid inside of S.H.I.E.L.D. in the Captain America movie “Winter Soldier,” and they corrupt from within. They scheme and plot, mislead and influence the ignorant and unprincipled until they can amass enough power that they can overthrow rightful leaders and seize the throne. The FBI is America’s premier law enforcement agency. Who is surprised to learn that there is a cabal within the FBI that is working toward overthrowing the rightful government to install their masters in power? Those masters are the leaders of the leftist liberal Democrat socialist party. This is not the whacko conspiracy theory of aliens taking over humanity. This is the all too typical human wicked leftist behavior to use infiltration, subterfuge, and corruption to achieve their goals. It only took 7% of Germans in the Nazi Party to convince another 30% of Germans to install Hitler and he took 100% of the power. Democrats have always been the party that wanted to be the rulers of America rather than the leaders. That they use deception and pandering now only indicates their weakness in being able to declare themselves openly as people recoil at the violence of Antifa and BLM. The purpose of law enforcement is to uphold the law as written by the elected representatives of the people. The President of the United States is not only Commander-in-Chief of the military, but also the Chief Executive in charge of law enforcement. His purpose is to have the nation’s Attorney General make certain that America’s laws are obeyed. Democrats threaten Trump not bring charges against Hillary and Obama because “the United States doesn’t punish its political enemies the way socialist dictatorships do.” Yet Obama had no such restraint in using that power as a bludgeon against his political enemies like Christians and the TEA Party. That’s exactly what the socialist Democrats did while they were in power and what they continue to do while out of power through the Mueller probe into the bogus Russian Collusion. The fact is that the United States government does punish those who do not violate Constitutional law, but it is used against those who violate that law, which Obama did throughout his presidency and continues to do through his anti-American organizations like Antifa that is the militant arm of his liberal fascist group Organizing for America. 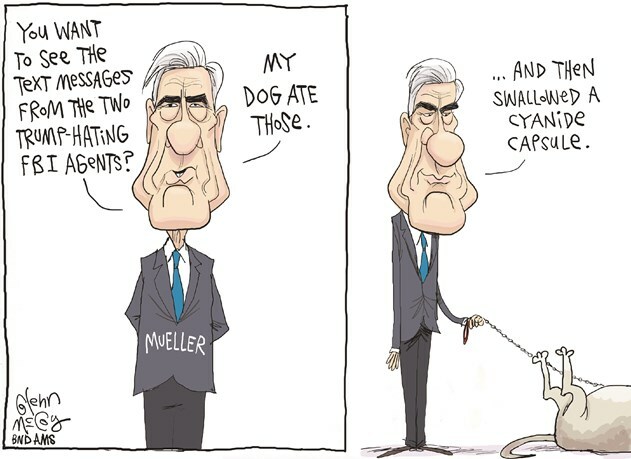 The communications of Peter Strzok which are now missing evidentiary proof, the machinations of Andrew McCabe, and the witch hunt being conducted by Robert Mueller are all part of the Obama regime’s efforts to subvert the government. The Left smears police as pigs, calls them racists, the KKK, and they call our soldiers baby killers and oppressors. Their military heroes, Manning and Bergdahl, are both traitors to America who gave military secrets to our enemies and got fellow soldiers killed. Obama brought the Muslim Brotherhood into the White House and who knows how many top secrets he spilled to his brother Muslims. He enabled the growth of ISIS and installed his kind of people at every level of the American government. When the FBI exonerated Hillary, after detailing her crimes as one of the most corrupt people to ever live, the Left applauded. Now when these FBI agents betray the duly elected president they praise them as standing up for principle. Their principles are those of America hating leftwing Nazi Communists that want to see the Constitution destroyed. The FBI is not supposed to undermine the president who is upholding the law as Trump is doing. They should have stood up against the president who overrode the law as Obama did both in ignoring the law that is written and in creating his own laws from the Oval Office. But these leftists in the FBI are Obamaites acting to undercut the law in order to destabilize the country by keeping rightful leaders from accomplishing lawful goals and aiding leftists in overthrowing them to seize power. These are the people, the corruption, the traitors that must be rooted out of the government and destroyed. America must educate the young and stop letting them be indoctrinated into the lies of leftist ideology so they can recognize when law enforcement is acting rightfully in applying the law and when they are acting wrongfully against the law. Teach them morality so they can recognize righteous laws vs. unrighteous subversion. It only takes a few bad apples in the FBI to spoil the bunch. Root them out and drain the swamp.